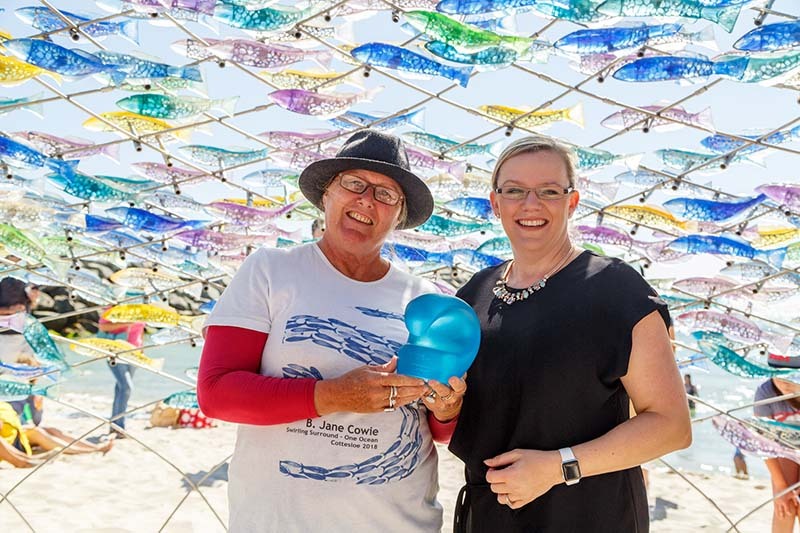 People’s Choice Prize Recipient, B. Jane Cowie with Fiona Drummond Managing Partner Western Region, EY, ‘Swirling Surround’, Sculpture by the Sea, Cottesloe 2018. Photo: Jessica Wyld. Kids’ Choice Prize Recipient, Denise Pepper, ‘Waiting in the Wings’, Sculpture by the Sea, Cottesloe 2018. Photo: Jessica Wyld. The $5,000 EY People’s Choice Prize is voted for by visitors to the exhibition and was awarded at Cottesloe Beach at 2pm on Sunday 18 March, by Fiona Drummond, Managing Partner Western Region,EY. The EY People’s Choice Prize is part of the sponsorship of Sculpture by the Sea, Cottesloe by professional services firm EY. Singapore-based Australian artist B. Jane Cowie was announced as the recipient of the EY People’s Choice Prize for her interactive sculpture Swirling Surround on Sunday 18 March, 2018. The stunning sculpture Swirling Surround depicts 999 ARTglass fish in a dome-shaped structure, which creates the illusion of a school of fish swimming amongst the visitors that are encouraged to sit inside the sculpture. “Congratulations to B. Jane Cowie on her fantastic sculpture which has captured the hearts and minds of the people of Western Australia,” said Drummond. “The exceptional artists of this year’s exhibition have demonstrated the positive contribution arts make in our community. That is why EY is committed to supporting the arts as they play a critical role in contributing to a vibrant economy, a diverse culture and community and in educating and inspiring our people. “This is our fifth year of sponsoring Sculpture by the Sea and the EY People’s Choice Prize and we are very proud to be involved. Not only does this iconic exhibition showcase our stunning Cottesloe Beach but by being free for the community, it provides people who sometimes don’t have the opportunities to encounter local and international art. Denise Pepper was also announced on Sunday as the recipient of the Kids’ Choice Prize of $2,000 for her sculpture Waiting in the Wings which delighted children of all ages. Inspired by Cottesloe’s vista, Pepper’s sculpture used marine grade aluminium and coloured mirror finish to create a set of wings that frame the picturesque coastline. Pepper was the 2017 recipient of the WA Sculptor Scholarship that provided her with the opportunity to exhibit at Sculpture by the Sea, Bondi 2017. The Kids’ Choice Prize this year was presented by Caitlin Shillington, Banjo Tolcon and Isobel McCully from City Beach Primary School. 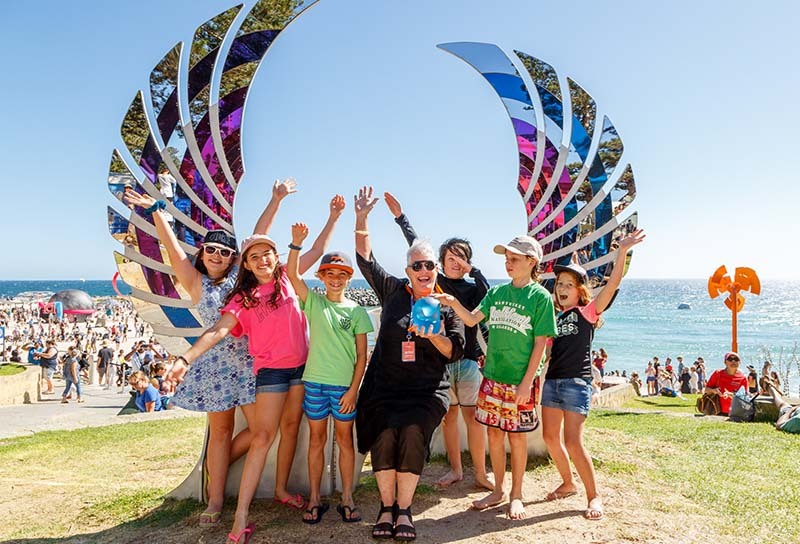 Sydney-based film and television producer Rebel Penfold-Russell, a long-time friend of the exhibition, along with her sons Emrys and Jasper, provide the Kids’ Choice prize as a part of their private support of Sculpture by the Sea in both Perth and Sydney.